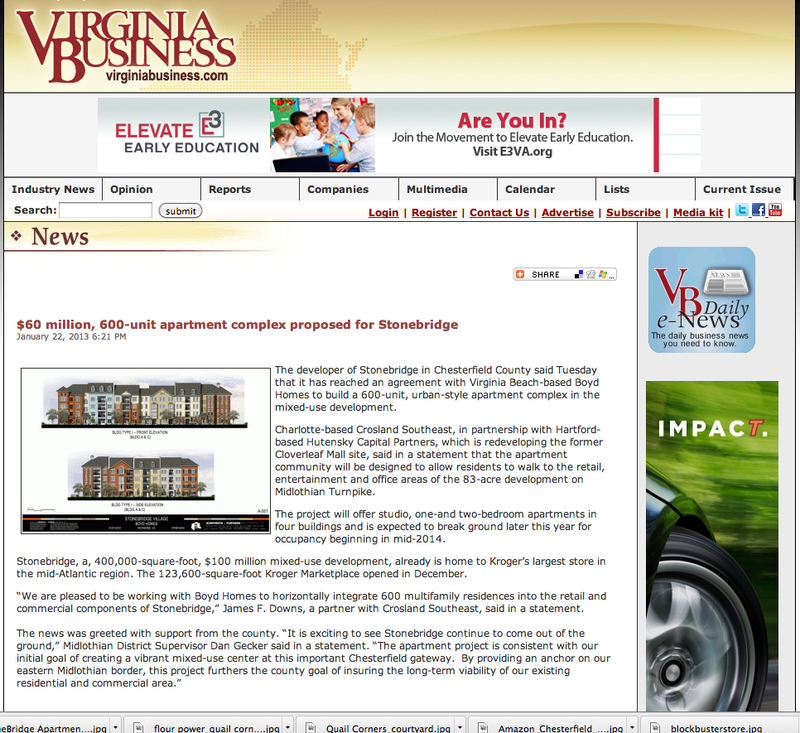 The developer of Stonebridge in Chesterfield County said Tuesday that it has reached an agreement with Virginia Beach-based Boyd Homes to build a 600-unit, urban-style apartment complex in the mixed-use development. Charlotte-based Crosland Southeast, in partnership with Hartford-based Hutensky Capital Partners, which is redeveloping the former Cloverleaf Mall site, said in a statement that the apartment community will be designed to allow residents to walk to the retail, entertainment and office areas of the 83-acre development on Midlothian Turnpike. The project will offer studio, one-and two-bedroom apartments in four buildings and is expected to break ground later this year for occupancy beginning in mid-2014. Stonebridge, a, 400,000-square-foot, $100 million mixed-use development, already is home to Kroger’s largest store in the mid-Atlantic region. The 123,600-square-foot Kroger Marketplace opened in December. “We are pleased to be working with Boyd Homes to horizontally integrate 600 multifamily residences into the retail and commercial components of Stonebridge,” James F. Downs, a partner with Crosland Southeast, said in a statement.